When I found out I was pregnant with my first, I read a million and one birthing books. I typed up and printed out a very solid birth plan. It was my greatest desire to have an unmedicated birth. If you’ve read his story, you know things didn’t go as planned that day. TG’s birth taught me so much about control, strength and surrender. His birth made me feel so strong but I also knew that when it came time to do it again, I’d want to do things differently. 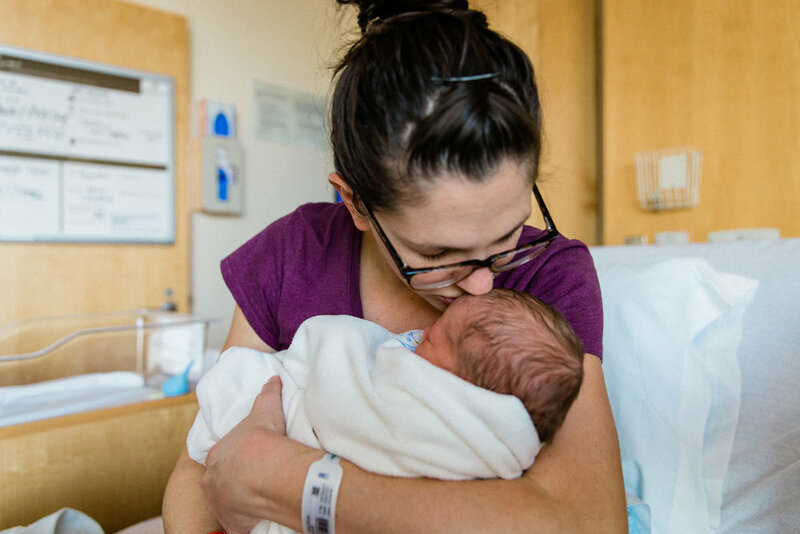 When I started thinking about labor and delivery for baby number two, I decided to go in with the same exact birth plan. An unmedicated birth free from intervention was truly how I wanted to bring this boy into the world. This time, however, I knew if it got to be too much I had other options. Nothing was set in stone. I decided to play it by ear letting baby boy lead the way.. my job was to do the best I could. Nothing more, nothing less. It was 7:30pm on November 11th when I felt my first faint contraction. I had gone to my room just about an hour before to lay down and rest. I was 38+6, so when I felt some light cramping in my abdomen I didn’t think too much into it. The cramping disappeared and returned — disappeared and returned. I laid in the dark room with my eyes closed feeling it all. Wondering. Preparing. I walked downstairs to fill my water and told Tom that I might be having contractions but couldn’t be too sure. When I got back upstairs I pulled out my camera and took some photos in-between the waves before getting ready for bed. If things were going to be different this time I knew I needed to rest. I was tracking the light contractions on my phone and they were 7-10 minutes apart lasting anywhere from 30-50 seconds. At 10:00pm I actually fell asleep tossing and turning pretty minimally. At 3:09am, though, I felt the first strong contraction and it lifted me right out of bed. I began tracking again for an hour and a half as they started to get stronger. Finally at 4:30am I woke up Tom. Things were getting real. I was definitely in labor. I quickly texted my Aunt Peg to see if she could come over to be with TG. We had Tom’s mom flying in that afternoon but we were going to have to leave for the hospital a lot earlier than that! At 6:50am we arrived at the Woodwinds birth center and I was on my way to triage for my IV by 7:00am. I had tested positive for group B strep (again) and needed to get on antibiotics right away. I felt rested, everyone was lively and I was breathing through contractions consistently. I was so grateful it was morning and I got decent sleep the night before. I was also able to fuel with a big bowl of oatmeal before we left the house. Food and sleep felt so important to me this time around and so far so good. At 7:20am I met the midwife Karen and she gently checked me for the first time. I was so curious to see how far I was dilated. She asked Tom and I if we had any guesses. “5cm?”, we said in unison. The midwife laughed as she nodded her head. Wow, I was already halfway there! I seriously couldn’t believe it! It was official. I was in labor and we got the go to check in. It wouldn’t be long now. When I had my first appointment at Woodwinds, I found out they had a water birth suite. One room available with a large tub that you could actually give birth in. When they asked if I was interested, I said absolutely so! I had read all about the benefits of a water birth and hoped when the day came the room would be available for me to use. To our luck, it was! 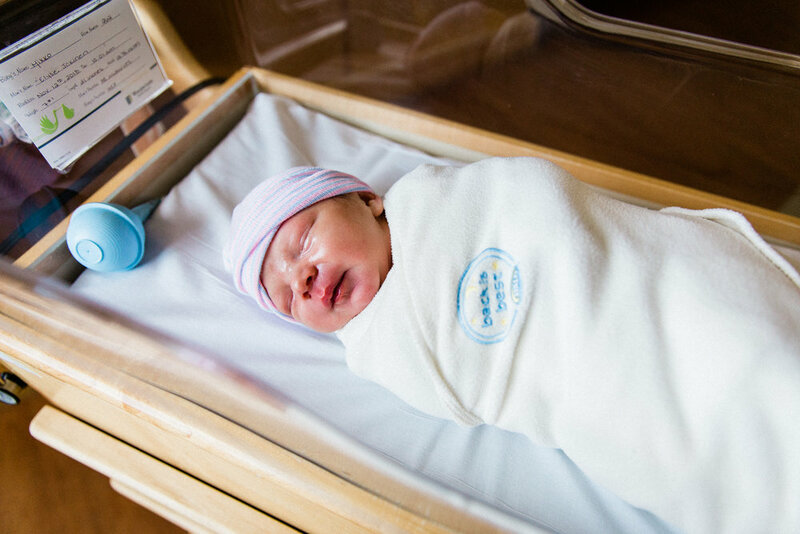 We were all checked in to the water birth suite by 7:30am — 12 short hours after I felt my first faint contraction. Once we were all set up in the room they gave me the go to do some walking. At 8:15am with Tom by my side, we set out to do some laps through the halls. We made it around the loop twice before the contractions got too intense. At this point they were painful and the doubt set in hard. I told Sarah I was pretty sure I was at my pain threshold. I could do this but I don’t think I could handle anything more. I hinted that I wanted an epidural. I pictured myself laying down in the bed with warm blankets as they took all the pain away. I couldn’t get that out of my mind. Sarah and Tom encouraged me. They reminded me of everything I said I wanted when we got there. I knew they were right but I just didn’t know how much longer I could go. Just then, Karen came in and asked me to give the tub a try. I stripped down, climbed the edge of the tub between contractions and lowered myself into the warm water. Oh, my, goodness… the relief. The relief! The instant I got in the water I felt myself relax. Melt. I bobbed until I felt a contraction coming. I grabbed the edge of the tub with my head down, totally focused. This time though, the sound I made was different.. softer. Nothing felt as intense as it was before. Tom was right there and he rubbed my back and encouraged me. Hearing is voice and having his touch was absolutely everything. He was right in my ear reminding me that every single contraction I made it through brought us closer to the delivery. He’d be here so soon. Not long after I got in the tub, at 9:10am, my midwife Karen came back in to check me. I couldn’t believe the way things had progressed. Was it really almost time to push? At this point though, my water bag was still in tact. Karen asked if she could rupture it and I agreed. As she turned around to get ready, I was hit with a contraction that took my breath away. Right in the middle of it I felt a burst. As soon as Karen saw the water, she advised the team to get the bed ready. There was meconium — baby had pooped — in the amniotic fluid and now it was in the water. This is one of the only reasons they have you get out of the birthing tub to deliver baby. Tom held me as I made my way back to the bed. At this point I wasn’t upset about leaving the water. It did what it needed to — I was to the point of no return and the only thing left do to now was bring this boy into the world. I got to the bed at 9:37am. At this point I was feeling it all and let me tell you, it was painful. I bounced back and forth between determined and focused and scared and doubtful. The encouragement from the room (Tom, nurses & midwife) really kept me going. I felt a contraction coming on and I didn’t even want to push. I wanted to be done. It hurt. I felt like I was never going to get through it. I wanted so badly to stop. I was filled with resistance and pain. As much as I wanted to stop though, I could feel my body continuing on. It was doing it, with or without me. During my next little break between contractions, I got SUPER focused, super determined. I had to. I remember thinking the only way out of this is through. I had gone too far to turn around and it’s so close to the end. My nurse and midwife recalled this moment with me after the birth because they both saw the shift. This change was everything I needed in the moment, and it felt very spiritual. It was time to push again but this time around I seriously gave it everything I had. Everyone, in unison, cheered, “PUSH!! !” And boy did I push. I gripped my legs with more power than I knew I had and every single bit of my body was alert and working. It truly felt like I was trying to push myself inside out. One more contraction coming and my God did I push. Then I felt it. I felt him leave my body. I did it. He was here. Looking back at my delivery now, I realize how short it actually was. From the moment I got to Woodwinds to the moment I was holding him was only three hours. I only pushed for 15 minutes. Everything seemed much longer than that. As for medication and intervention? We didn’t use any. The best part was there was no episiotomy and I didn’t tear. The water got me through and we did what we set out to do making my recovery much more smooth. As I reflect, I realize what a different experience I had with Thomas George, everything about it. It also reminds me of what I first wrote on the post of TG’s birth. Nothing has felt more true. 7 lbs. 1 oz. | 21 in. Thank you to all of our family and friends near and far. We felt all of your prayers and well wishes.